Pink Floyd’s best music is more than anything else about ambient sound: the slow trance-inducing bass/drum throb, the ethereal organ and synth backdrops, the sighing and crying guitar lines, the clever and unexpected sound effects. It was a sound achieved through a combination of offbeat ideas, innovative recording techniques and a cosmic ambience that is peculiarly their own. It's more than a little ironic that Pink Floyd’s most famous song “Another Brick In The Wall (Part 2)” is so far removed from what is special about the music of this, the quintessential and most influential of the psychedelic ambient spacerock bands. Wrote New Musical Express in 1988: “No rock group experimented with sounds as imaginatively as Pink Floyd, with such limited technology and a commercial feel...their music was informed by a wealth of ideas that puts most of their peers to shame, past and present.” Roger Waters’ talents as a lyricist notwithstanding, Pink Floyd’s best music is more than anything else about ambient sound: the slow trance-inducing bass/drum throb, the ethereal organ and synth backdrops, the sighing and crying guitar lines, the clever and unexpected sound effects. It was a sound achieved through a combination of offbeat ideas, innovative recording techniques and a cosmic ambience that is peculiarly their own. The original line-up consisted of the late Syd Barrett (guitar & vocals), Nick Mason (percussion), Roger Waters (bass & vocals) and the late Rick Wright (keyboards & vocals). Adopted as the virtual house band by London’s swinging underground in the mid-60’s, the band held audiences spellbound with live sets of swirling, improvised, often instrumental music created under the leadership of the charismatic Syd Barrett. His spontaneous, madly energetic guitar playing was highly innovative for its time and his surreal, whimsical style of songwriting - though less apparent in their live shows - is preserved splendidly on the band’s first album The Piper At The Gates Of Dawn (1967). Four decades on, Barrett’s acid-drenched fairytale world of astrology, scarecrows and magical kingdoms is still a wonder to behold. Unfortunately the Floyd’s trippy concert workouts of this period were never captured on record, though the album does contain a few exploratory instrumentals. “Interstellar Overdrive” in particular sees the band laying the groundwork for extended epics to come. However, it was to be a future without Barrett whose drug-fuelled slide into strangeness and paranoia nearly destroyed the group. In truth, it destroyed Barrett; after a few solo albums in the early 70's he became a recluse right up his quiet death in 2006. But his replacement proved a worthy one: old school friend and guitar tutor David Gilmour. His probing, melodic, spacey guitar lines and smooth, resonant vocals soon became one of the Floyd's most recognisable trademarks. After a couple of patchy albums, the new line-up started to find its feet on the double album Ummagumma (1969). Coming in two distinct parts, the first half of the album consists of four largely instrumental tracks taken from live concerts in Britain. Graced with Wright’s exotic Farfisa organ work and Gilmour’s spacey guitar lines and textures, tracks like “Careful With That Axe, Eugene” and “Set The Control’s For The Heart Of The Sun” see the quartet brilliantly extend and improvise on the original studio recordings to create otherworldly, primordial soundscapes. It's masterful ambient rock and captures Floyd at its peak as a live band: daring and wonderfully inspired. Ummagumma’s second half contains the band’s most experimental studio work - an erratic yet still fascinating collection of pastoral folk-like pieces, surreal tapestries of mellotron and sound effects and strange Eastern-sounding dirges. Overall the album is a daring mixture of rock, electronics and classical avant-garde techniques and its influence has been enormous. It became one of the blueprints for a whole generation of emerging art rock acts including Tangerine Dream, Kraftwerk and Klaus Schulze. The challenge now for the Floyd was to redirect the experimental inroads made on Ummagumma into a more accessible sound. First came Atom Heart Mother (1970), with the entire first half being an ambitious and highly underrated six-part suite featuring brass and choir arrangements written by Scottish composer Ron Geesin. Even if the main brass theme resembles a vaguely cheesy Western film score, the extended sequences of guitar/organ interplay on the title track are extraordinarily dreamy. The middle section builds splendidly, starting as a slow funky jam which gradually deepens as dramatic choral stabs start to appear in the mix. The standout track from the next album Meddle (1971) is a further refinement: the extraordinary twenty minute-plus opus “Echoes”. Largely instrumental, “Echoes” brings together everything the early Floyd did best: an expansive, cosmic, richly integrated tapestry of rock improvisation, melodic themes and surreal passages of abstract sound. Both Atom Heart Mother and Meddle are also utterly charming time capsules of the band's way with lovely, pastoral hippie folk songs: the pristine "A Pillow Of Winds", the liquid lap-steel guitar phrases of "Fat Old Sun", and the soaring keyboards/brass/vocal blend of Wright's quite thrilling "Summer '68". 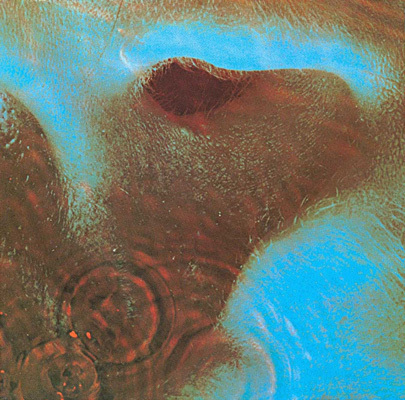 Two years after Meddle came The Dark Side Of The Moon (1973) which skyrocketed the Floyd to superstar status and spawned the highly irritating but catchy U.S. hit single “Money”. Revolving around Roger Waters conceptual lyrics about madness and the pressures of the everyday, the compositions and sound effects on Dark Side are woven together seamlessly with a standard of mix and production that today still sounds exceptional (kudos to engineer Alan Parsons). It’s a fine album, and an uplifting one too despite the dark lyrical content. However with a few exceptions - “The Great Gig In The Sky” and "Us And Them " - Dark Side is a significant departure from the Floyd’s more cosmic explorations of the past. Perhaps more satisfying in that context are the follow-ups Wish You Were Here (1975) and Animals (1977), which have longer instrumental passages and a spacey mood and intensity that is uniquely the Floyd’s. The mammoth nine part “Shine On You Crazy Diamond” from Wish You Were Here is a magnificent example of what Rolling Stone critic John Rockwell winningly called the Floyd’s special sense of "line and continuity and ritualistic repetition". The opening sequence - featuring Wright’s richly textured keyboards and a simple Gilmour guitar solo - is mournfully, breathtakingly beautiful. Entire albums of ambient music have been inspired by this one short but unforgettable sequence. The cinematic, soaring and deeply brooding Animals proved to be the swansong of a tightly-knit creative quartet writing and producing their own albums. Like the bulk of Wish You Were Here, the long pieces on Animals were developed and played on the road for several years before being laid down in the studio. "Dogs" is epic and full of space, while "Sheep" captures the quartet in full flight, sighing and surging in a veritable sea of guitar and keyboard harmonies with Water's throbbing baseline rumbling below. The Animals album marks the end of classic Pink Floyd. While they remained an entertaining live act for several decades more, after the mid-1970's the band was exploring cosmic spaces and extended minimalist ideas much less frequently. Making actual music was also eclipsed by protracted personal and legal squabbles. A period of well-documented acrimony within the band, including Rick Wright's forced departure, coincided with the release of two brilliant but wordy concept albums The Wall (1979) and The Final Cut (1983). Both are dominated by Roger Waters but have significant musical input from Gilmour, American producer Bob Ezrin and various session musicians and arrangers. Here the subjective qualities and sustained moods of the band's earlier music are gone, replaced with narratives that quite deliberately reign in the music instead of letting it fly. This is rock theatre, and while both are great albums, neither of them sit at all well in an ambient rock context. A few years later Waters filed suit to dissolve the name Pink Floyd and end the partnership. Amid lawsuits and some very public fighting between the estranged band members, Gilmour and Mason still managed to record A Momentary Lapse Of Reason (1987), a more traditionally-Floyd sounding album but rather anonymous, mechanical and cold. Again, the band called on the aid of producer Bob Ezrin and a huge team of lyricists and session players (Wright only briefly among them). However, the belated follow-up The Division Bell (1994) is a much warmer effort and jettisons most of the hired help. It comes closer to capturing the band's original magic and reunites Gilmour creatively with Wright for the first time since the 70's. There is some fine, epic ambient rock like "High Hopes" and a lovely cosmic instrumental called "Cluster One". The album is a beautiful listen even if sonically the band shows a tendency to recycle past glories into bite-size pieces, as glorious and unique as those pieces may be. Several live albums from this period (1989 and 1995) are of limited value; latter-day Floyd concerts were always a visual experience and the performances are no different from the studio albums. "It is hard to overstate the importance of his musical voice in the Pink Floyd of the '60s and '70s. The intriguing, jazz influenced, modulations are omnipresent in all the collaborative work the four of us did in those times. Rick's ear for harmonic progression was our bedrock". Seven years after Wright's death, the appearance of The Endless River (2015) was a real surprise - an intriguing 53 minutes of new instrumental material based on 1994 sessions for an abandoned 2nd "ambient" disc that was supposed to accompany The Division Bell. The original music was in an unfinished state, so starting around 2009 some more overdubs were added and some of the material handed to several different producers to see how they might stitch it together, including long-time associate Andy Jackson and dance/dub producer Youth (producer of The Orb's classic early albums, among others). This went on for some years until finally they had 18 tracks - 17 instrumentals and one song - that were grouped into four long sections or chapters. If nothing else, The Endless River's healthy sales in 2014 said much about the power of the Pink Floyd brand. But for fans of vintage Floyd the album offers unexpected delights and a return to what some have always believed is the band's true essence. Although Gilmour is still very much in charge, in a creative sense the band members collaborate more here than at any time since the mid 1970's. It certainly captures Gilmour and Wright's sonic legacy; spacey, melodic passages cast in a recognisable rock framework, but with that special sense of mystery and a gentle, pastoral psychedelic quality that's so very Floyd and very British. The album focuses on a side of Pink Floyd that most of us never thought we would hear again and The Endless River's extended instrumental passages deliver on that front more than anyone could have expected. Not the band's greatest album by any means, but a varied, complex and beautiful farewell to Wright.